Milk is one of the most convenient ways to add extra protein and calcium to your diet. You can drink it plain, use it on cereal, or create a wide range of shakes and smoothies with it. The only limit to the uses for milk in your diet is your imagination. If you walk past the milk displays at a grocery store, you'll see an almost overwhelming number of selections of different types of milk. Traditional dairy-based offerings include skim, low-fat, whole, lactose-free, and flavored milks. Non-dairy milks include soy-, rice-, and almond-based offerings, with a wide range of flavor and caloric options. Which you choose depends on your caloric needs, food sensitivities, and personal taste. Your first step in choosing a type of milk is thinking about your nutritional needs. An eight-ounce serving of cow's milk contains approximately 8 grams of protein, but can vary from a high of 146 calories for whole (3.25 percent fat) milk to a low of 83 calories for nonfat or skim milk. Flavored milks can have added sugar and may have more calories. Reduced (2 percent) fat milk contains 122 calories and low (1 percent) fat milk weighs in at 102 calories. Goat and sheep milk are higher in both calories and protein than cow milk. Milk is a good source of several nutrients, containing 30 percent of your daily calcium needs and over 20 percent of your daily needs for vitamin D, phosphorus, and certain B vitamins. Lactose intolerance, caused by your body not producing the enzyme lactase needed to digest lactose, a sugar found only in milk, affects over 65 percent of adults. If you experience bloating, gas, cramping, nausea or diarrhea after consuming milk, choose lactose-reduced dairy products and non-dairy milks, or take lactase tablets or drops before consuming dairy products. Whether you are lactose intolerant, have ethical objections to animal products, are trying to reduce cholesterol and saturated fat in your diet, or just don't like the taste of milk, you have the following non-dairy milk alternatives: rice, soy, coconut, or almonds. 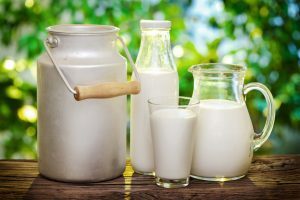 Non-dairy milks vary in nutritional content, but generally have similar amounts of protein to dairy milk, are fortified with calcium and vitamin D, and have no cholesterol. Soy milk contains phytochemicals (plant-based nutrients) that have what is known as weak estrogenic effects. There are contradictory reports regarding soy as related to some forms of cancer…some reports, according to the American Cancer Society, suggest that soy products taken in moderation may reduce women's chances of breast cancer; other reports suggest that soy may increase the risk of some cancers. On another note, some women find that soy products may reduce menopausal symptoms. Although organic and conventional milk have similar nutritional benefits, many families prefer organic milk because it comes from free-ranging cows that were not given antibiotics or Recombinant Bovine Growth Hormone (rBGH). Organic milk also has slightly higher levels of heart-healthy omega-3 fatty acids. If you are trying to lose weight, a low- or nonfat milk, whether dairy or non-dairy, is probably your best choice. If you are trying to reduce menopausal symptoms, you may want to consider a low-fat soy milk. If you have issues digesting milk, try a lactose-reduced dairy milk or a non-dairy product.